Raw, confronting and honest, UFC champion Mark Hunt’s inspiring autobiography shows it is possible to defy the odds and carve a better life. Born into a Mormon Samoan family, Hunt details his harrowing early life, his troubled teen years, and his angry youth with no apparent future. After being plucked from an Auckland street fight and dropped into his first kickboxing bout, Mark went on to achieve unprecedented success in Australian and New Zealand combat sports. 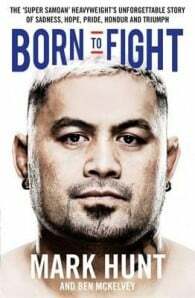 In an ongoing career that has spanned the globe, Mark Hunt has been in some of the UFC, Pride and K-1’s most memorable battles. But in some ways those fights pale in comparison to that which he has overcome out of the ring and cage. As fearless with his opinions as he is in the Octagon, Mark pulls no punches in revealing the highs and lows of his extraordinary life.